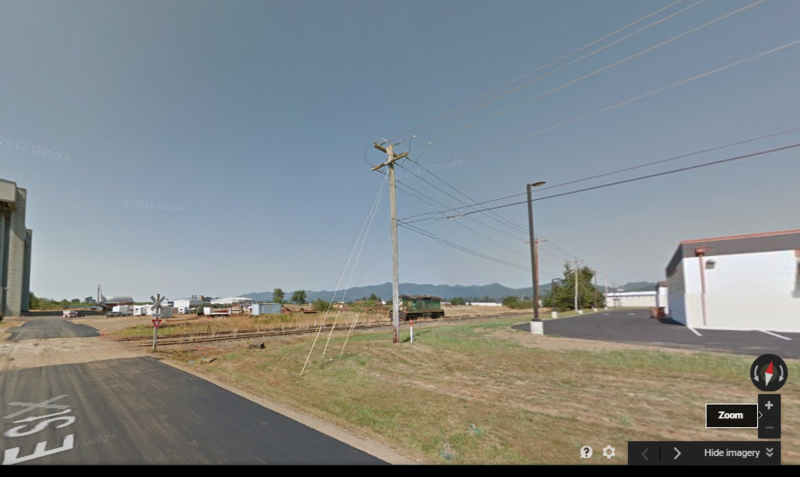 I work for an electric utility, and Google Street View is a very handy tool to do a quick “field check” to verify, for example, equipment or pole specifications. It can save a lot of time, and gas! Of course, the Street View data may not always accurately depict what’s in the real world since things change, but it’s still a very good source to have available. To use this Google Street View Python Add-in, first download the add-in by clicking the link at the top of this page. Next, install the add-in. This should add the following toolbar to ArcMap. 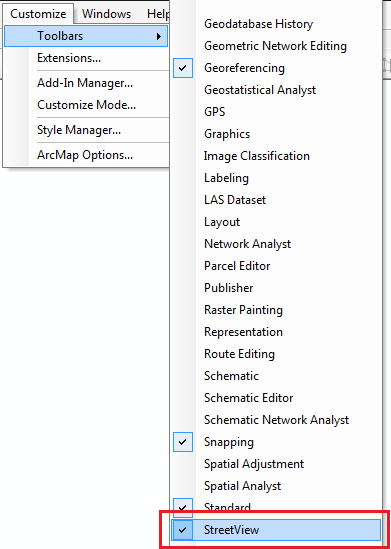 If it didn’t automatically add the toolbar, in ArcMap go to Customize –> Toolbars –> and click on Street View. Once the toolbar is visible, click on the Street View icon, and then using either satellite imagery, or some other landbase data click on a road. Once a road is clicked, your browser will open and show that location within Google Street View. If the screen that loads is black, then there is no Street View data available for that location. Any chance to add just the regular Google map view as well? Thanks for the very handy add-in. I was wondering if you have built this add in for Arc Explorer desktop? I have built a similar python add-in for accessing Bing/Esri/Google (BAG) Web Maps directly from within ArcMap. Originally I even had the ability to “Grab Google Aerial” image tile and automatically georeference directly into ArcMap, all via a single click. This proved to be very popular..so much so that Google got wind and let me know that it violates there Terms of Service (TOS). I thought I was in compliance with the Google Maps TOS, but sadly I was not. I am not sure where your Street View Tools falls..but my guess is that you are okay. Get the “BAG” tool here. the BAG tool is everything I was hoping to find. Thanks!!! Hey Chris, thanks for the comment! Thanks Ian. This will be useful for many of our CrescentLink users. Thanks, Brian, good to hear from you! Thanks for sharing this. It is a neat tool. I installed the tool and it works well. Thanks for sharing! Very handy! We use Street View to help us locate water meters in the field. This tool will save us time. Thank you! Thank you for posting this handy tool. I’m not sure why, but it works great in some .mxds, while in others (where I know there is streetview imagery) it shows black and in the preview images at the bottom it is showing places in Alabama. I am in western NC. Any thoughts on why this might be? I have made sure that the data sources are the same as in the .mxd that works. Well, the tool uses the coordinate system of the ArcMap data frame. When you click on a road, it grabs the coordinates of that location, and assigns the data frame coordinate system. It then reprojects these coordinates into WGS84. I’ve seen another person have a similar issue, and it’s because their data frame uses a Custom coordinate system, which causes problems when reprojecting. Just so other people know, the problem had to do with the Layout vs Data view. Apparently, the Street View tool will not work if you’re in the Layout view. Just installed and tested using ArcGIS 10.3. Toolbar installed but had no button until I added it through Customize > Commands. But it appears to be working well and will be a great tool. Thanks for sharing! Thanks for the information, James! This is a great tool, any chance you are willing to share the source? I’m interested in learning how to do this kind of thing myself. Thanks! If you open the add-in file with something like 7zip, you can see all the contents. The source code is inside the Install folder. What browser is this set to open in? When I click on a street, it brings up IE 9 and says it is running in lite mode. There is no street view and I am not positioned correctly in the map. Hi David, it uses whatever is set as your default browser. Is there a way to adapt the source code to make it launch Chrome by default to resolve the IE 9 Google Maps Lite issue? Hi Beth, it should open in whatever browser is set as your default. So, if you want it to open in Chrome, you need to set Chrome as your default browser. Nice and simple, exactly what i was looking for. Thanks! Ian, I upgraded to ArcGIS 10.4 without realizing your streetmap tool will need to be updated as well. Any idea if/when you can get a new version. Great tool, btw, very good time saver. Hi Jeff, I will be adding the 10.4 versions shorting. Thanks for the comment! This is very good! I got the 10.4 versions and it was very easy to add them onto ArcMap. Thanks Ian! You are a lifesaver. I am the GIS department for a water utility. Being able to look for valves and meters with this tool is a godsend. Hi Kevin, thanks for the comment! I’m glad you’re finding the tool useful. This is very useful Ian, Great Work. Thanks a lot, great ideal, great development. Please, am in to land management and SAR data processing , do you know any noble tools in that aspect. Great tool, thanks for this. I immediately started using it. Thanks! It works great and is useful. Looking for this on ArcGIS online maps and Collector also. where the lat and long would be parameters coming from attributes in your feature class. That is probably the only way you could do something like that In Collector, since there is no function that I know of to add third party widgets to Collector. I wonder if this script is compatible with ArcMap 10.5 or 10.6.